Only 1398 of the 2048 pages could be bound in one book, but the entire book is also available as PDF-file on the CD-ROM (some chapters are only available on CD). You can now order C++Builder 5 Developer's Guide from Amazon.com and Amazon.co.uk (with significant discounts). Note that I get a small commission for each on-line order from my website (so thanks in advance for those of you who ordered). 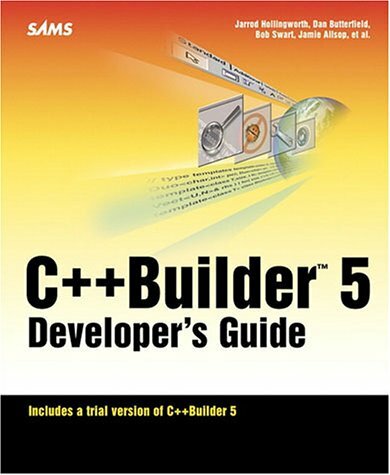 This book, the only book about C++Builder version 5 in the english language, has been available (and shipping) since Wednesday December 6th 2000. Here's the table of contents, of this 1398 page book (for which I wrote more than 120 pages myself, hence my name on the cover, next to the names of Jarrod, Dan and Jamie). The errata is available too. Brian Long has written a detailed review of the book! As you can see, I wrote chapters 13, 19 and the ASP/ActiveForm parts of chapter 22 of the C++Builder 5 Developer's Guide.